hi, First of all I want to personally thank you all for your support and the appreciation you been showing to anxiety social net. Less than a year ago when I started this site I hadn't expected the site grow so much and reach so much people so fast, we have come a long way and I have big plans for the feature. So How Can You Help Us Grow? 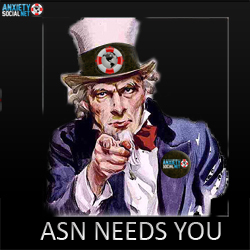 We want to ask you to help us spread the word about anxiety social net all around the internet. If you have the chance to share our site in social networks, personal blogs, personal sites, related sites or anywhere where other people may be interested. The more links point to our site, the more people will come through Google and other avenues.